Preference in caliber amongst the shooting public and military changes through time. 9x19mm Luger, also called 9mm Luger, 9mm NATO and 9mm Parabellum, has been subject to these trends more than any other handgun cartridge. Let’s now take a brief look at the history of this cartridge to better understand its performance capabilities. The 38 Long Colt was among the most common handgun cartridges at the beginning of the 20th century. It developed an unenviable reputation as having poor ‘stopping power’ during a US military operation to suppress resistance in the southern Philippines in the late 19th century. Ask anyone who has worked at a gun store for a while or who is familiar with the ‘standard’ firearm lore and they will tell you how ineffective this cartridge was and how it cost many US servicemen their lives during that conflict. Such statements demonstrate a desire for the dramatic and a fundamental misunderstanding of handgun hit probability and a living creatures ability to continue to fight despite being wounded (or completely missed). Firing a 150gr bullet at approximately 775 ft/sec, the 38 Long Colt is similar to the 38 Special which fires a 158gr bullet at 755 ft/sec. This 38 Special roundnose cartridge was the standard police cartridge in the United States for most departments and continues to arm police and security forces around the developing world—despite the minuscule difference in performance potential with the ‘inferior’ 38 Long Colt. 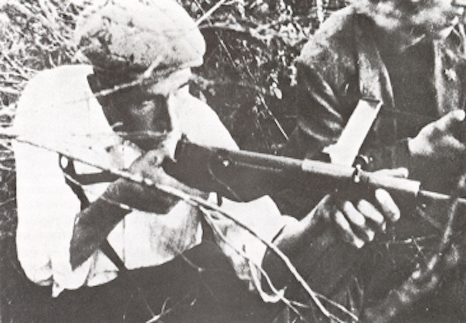 The German army developed and issued the 9mm Luger starting with World War I and the popularity of this caliber has generally been on the increase ever since. A quick look at the performance potential of the three cartridges quickly reveals that the 9mm Luger has greater potential to wound the target, in the form of kinetic energy, than the (then) military-approved 38 Long Colt or the long-time police standard 38 Special. Why is it then that the 9mm Luger is praised by one person and derided by another? It goes back to the need of the speaker to be able to say something important and a misunderstanding of terminal ballistics and hit probability. For some people, speaking first is more important than conveying factual information. We deal in facts here. The US military adopted a 45 ACP handgun after the reported failures of the 38 Long Colt to stop the Filipino resistance fighters. A discussion of how 9mm Luger compares to 45 ACP can be found here. 9mm Luger handguns are advantageous when compared to the larger caliber handguns because they can hold more cartridges in the magazine. Famous firearms trainers will say that “this doesn’t mean you can shoot more .. it means you have to reload less.” Any kind of assault usually happens with little or no warning. It is unlikely that an attack will take place while you are well rested and in broad daylight on flat terrain. Scoring hits with a firearm requires proper bone alignment. What I mean by this is that you cannot use muscle strength to ‘pull’ the gun onto the target. Human muscles cannot ‘twitch’ fast enough to respond to the rearward movement of the gun upon the start of the weapons recoil. So your bones must be in a relaxed and neutral position before you pull the trigger—like an archer or a golfer, your entire body needs to be lined up for the shot. This is all a fancy way of saying that more misses occur during a self-defense shooting than hits. Professional training and a proper mindset go a long ways to correcting our faults in this regard but no one is perfect. You will likely miss more than you hit. Especially for the smaller CCW type guns, the 9mm Luger is a good way to increase magazine capacity and still shoot a small and effective firearm. US Army “HEL Lab” experimental results indicate that the maximum effective range for the M1911 under simulated combat stress is a scant 12 meters when shot by the tested group of Army soldiers. US Army soldiers qualified with a M1911 handgun scored a 40% hit probability when firing under simulated stress at a distance of 12 meters. This study was done by the Human Engineering Laboratory at Aberdeen Proving Ground. Handguns are by their nature a secondary weapon—they simply cannot be as powerful as a rifle due to size and recoil restrictions. It may be necessary to score multiple hits against an attacker if they do not decide to surrender or flee. 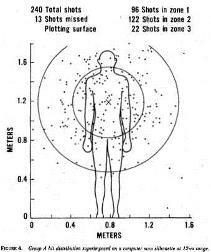 Now that we have touched on the reality of marksmanship during a real defensive shooting, it naturally follows that we discuss what the bullet does when it strikes a target. The 9mm Luger is often criticized because “a 45 doesn’t shrink but a 9mm has to expand.” I file statements like that in the same drawer as statements like “any hole you can dig, I can dig bigger.” It’s a nonsensical statement meant to generate emotion. 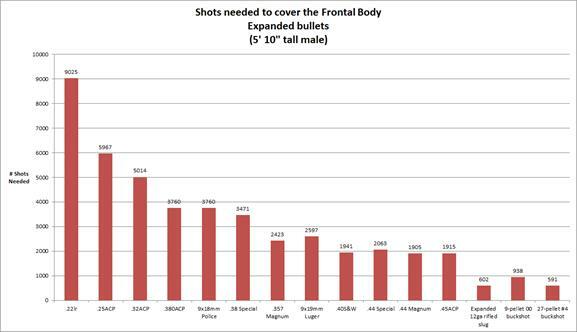 The plot (Figure 3) at left illustrates how many bullets you could fit on the front of the body of an average-size male in the United States (assuming that you could also fill the spaces between the bullets.) 9025 EXPANDED 22 LR bullets are needed to cover this target while 1915 EXPANDED 45 ACP bullet are needed to cover this target. Since the body is so large of a target, it behooves us to view the terminal performance of a bullet more as a ‘point’ than as a ‘hole you can throw a cat through’ as some erroneously suggest their hollowpoint brand or firearm de jour is capable of making. The slow motion videos that you see on this website provide us with the ability to slow down the bullets travel enough so that, with a measurement scale visible in the frame, we are able to measure the distance traveled from the scale and the time elapsed from the time step that the high speed camera imprints on the video. Distance divided by time is the velocity and the acceleration is the time derivative of velocity. With the weight of the bullet known, we can then use the acceleration and velocity to calculate the fluid drag acting on the bullet. The drag force acting on the bullet is equal to the force that the bullet is applying on the tissue and this is the quantity required to penetrate organs and other soft tissue. An example video is provided. 9mm Luger represents the minimum caliber that I consider acceptable for self-defense usage in a medium- or full-size handgun. There is no reason to carry anything less because the recoil is so manageable. For mouseguns, 9mm Luger represents the practical maximum. Weapons such as the Rohrbaugh P9 and later comers to this genre of gun produce a product which is a big step up ballistically from 380 ACP—but you pay for it with your wallet and wrist. You have a wide margin for error with ammunition selection with this caliber so most any quality JHP will be suitable for carry during the summer months when people are wearing thin articles of clothing. Ammunition selection gets more complicated when heavy winter clothing must be shot through or barriers like car windshield glass get in the way. I would encourage you to browse through our collection of 9mm Luger terminal ballistics information below to get a feel for what these barriers can do to your shot. So cheap and available, everyone can own it now. Light Clothing is placed in front of the gelatin block to simulate an attacker wearing summer clothing. We test a 9mm Luger and six different types of ammunition against synthetic bone plate and gelatin. FBI Standard test fixture simulating a target using an exterior wall or door for cover.